FINDING FONTAINEBLEAU (On-sale: May 17, 2016; $27.00; ISBN: 978-0-525-42880-0) recounts the adventures of Carhart and his family—his NATO officer father, his mother, four siblings, and their dog—in the provincial town of Fontainebleau, France, in the 1950s. Dominating life in the town is the beautiful Château of Fontainebleau. Begun in 1137, fifty years before the Louvre and more than five hundred before Versailles, the Château was a home for Marie-Antoinette, François I, and the two Napoleons, among others, all of whom added to its splendors without appreciably destroying the work of their predecessors. With characteristic warmth and humor, Carhart takes readers along as he and his family experience the pleasures and particularities of French life: learning the codes and rules of a French classroom where wine bottles dispense ink, camping in Italy and Spain, tasting fresh baguettes. Readers see post-war life in France as never before, from the parks and museums of Paris (much less crowded in the 1950s, when you could walk through completely empty galleries in the Louvre) to the quieter joys of a town like Fontainebleau, where everyday citizens have lived on the edges of history since the 12th century and continue to care for their lieux de mémoire—places of memory. I’ve always loved memoirs and over the last several years, I’ve become addicted to memoirs of people living in France. (In truth, this addiction probably started decades ago when I read Peter Mayle’s first book). For some reason, I kept thinking Finding Fontainebleau was a novel, until I finally sat down to read it, and then I was delighted to find out this engaging, sometimes funny, often poignant book was actually a memoir. I haven’t read any of Thad Carhart’s earlier work, but I found myself completely drawn in by his words, and the way he worked the profiles of historical figures into his personal narrative. I also appreciated the way he balanced historical travelogue with his own experiences in post-war France. I felt like was in a bubble of past-France, as filtered through someone who is living in contemporary France, and I enjoyed the experience so much that when the bubble burst at the end of the book, I was a bit let down. This is a fascinating, compelling memoir, and I enjoyed it immensely. Goes well with Nutella and banana crepes, and a cappuccino. One lucky reader (no geographic restrictions) will win a print copy of this book. Leave a comment here on this post telling me what foreign country you’d love to spend six-twelve months exploring. Contest is open until 11:59 PM CDT on Friday, July 22nd. 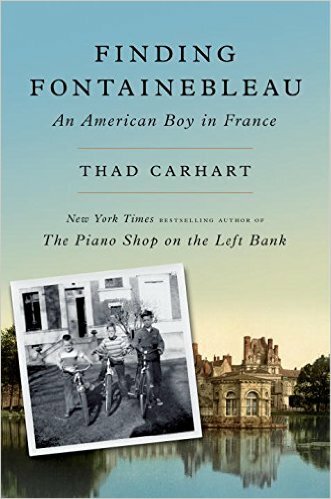 Review: Finding Fontainebleau, by Thad Carhart – with Giveaway by Melissa Bartell is licensed under a Creative Commons Attribution-NonCommercial-ShareAlike 4.0 International License. I would love to spend a year exploring Italy and I wonder if that would be sufficient to fulfill my cravings for this beautiful, fascinating, incredible place which has me under its spell. The history, culture, romance, charm and culinary delights beckon me. This book appeals to me for so many reasons … a fascinating location, a time of turmoil and hope, a personal story, and gorgeous writing … there’s so much to love!